Press Coverage – Blue Frog Simple Solar | We bring together FINANCING, EQUIPMENT and INSTALLATION to make residential solar easy for YOU! 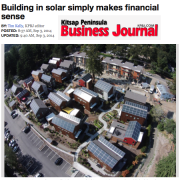 Blue Frog Solar and our Simple Solar program got some great press this week with an in-depth feature in the Kitsap Peninsula Business Journal. Read it Here. The KPBJ ives a comprehensive look at the incentives that make Washington solar such a great deal — and Simple Solar, which makes it easier than ever to make the move to energy self-sufficiency. It’s a great move for both existing homes and new construction. Blue Frog is collaborating on the largest residential solar project in Kitsap County — Bainbridge Island’s Grow Community, a project of real estate development and investment firm Asani. It’s an example of effectively designing and building homes to accommodate rooftop solar panels. 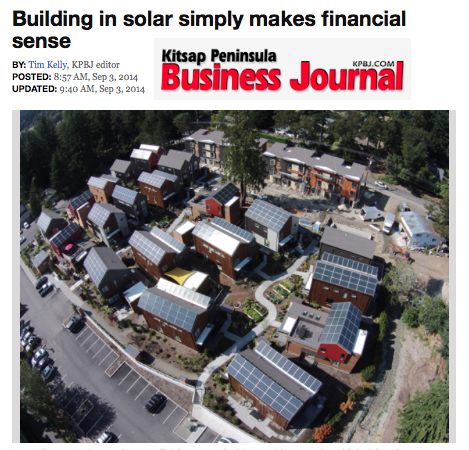 Thanks to the Kitsap Peninsula Business Journal and editor Tim Kelly for the great coverage! Find out more about Simple Solar here. 1. Tell us a little bit about yourself, are you originally from Washington? I grew up in Corvallis, a small university town in Oregon, though I also lived in Europe and Central Africa as I was growing up. Our family was green before green was cool – we grew our own food, we put sweaters on when it got chilly instead of turning up the heat, and we rode our bikes everywhere. We did these things not just because they conserved resources, but because they saved money. My parents made sure we spent a lot of time in the outdoors, skiing, sailing, climbing, hiking and learning to appreciate beautiful natural places. They instilled in me a sense of wonder for the incredible places on our planet, and a desire to preserve those places so my children can experience them as I did. 2. How did you get into the solar industry, what inspired working in that field? I’ve spent the last four years on a development team creating a net-zero energy residential development. After extensive research we found that solar was the best option to provide all the renewable energy needed for our project. We partnered with BlueFrog Solar, itek energy, and A&R Installers to create a solar package that would be easy for home buyers to choose. 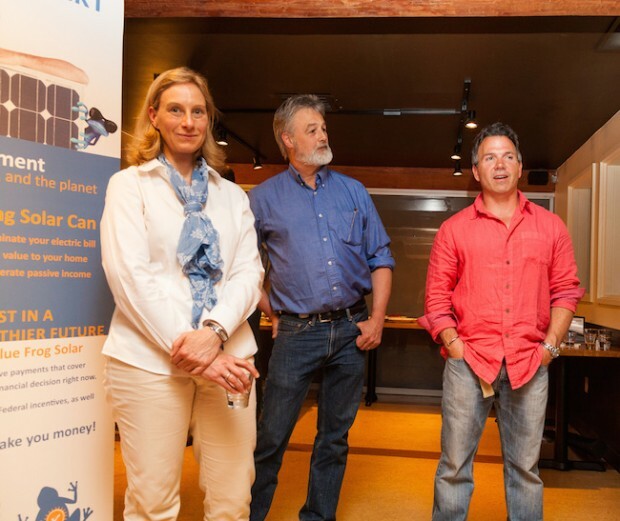 We also partnered with a local credit union, Puget Sound Cooperative Credit Union, so our buyers could access zero-down financing for their solar arrays. We essentially eliminated all the barriers, financial and otherwise, to make it easy for our home buyers to add solar to their homes. We had incredible success with this program, with almost 100% participation. I am now applying what I learned through that experience to create BlueFrog’s Simple Solar program, helping other developers and homebuilders to offer solar to their customers. 3. How did the Bluefrog Solar and Dwell Development partnership come about? When did you start working together? We’ve known Dwell Development for some time, sharing information and ideas on how to build and market energy efficient homes. Dwell’s homes are all built solar-ready in anticipation of someday adding solar panels on each roof. We’ve talked with Dwell for a couple years about helping them add solar as an option to their homes when the time and the cost was right. That time is now, as the cost of solar equipment has come down almost 60% over the last two years. The cost of the system, including equipment and installation is now at a point where the federal and state incentives essentially pay for the system over 5-6 years. With the zero-down financing from PSCCU and the incentives that cover the loan payments until the system is paid off, there is really no reason not to add solar now. 4. You’ve recently had some pretty big success, including a one hundred percent buy in at a new eco friendly community on Bainbridge Island. Tell us a little bit about that project. The Grow Community project on Bainbridge Island is a One Planet community, one of seven communities in the world endorsed to a very high standard. To meet the One Planet principles, the community of 131 homes is designed to reduce the carbon footprint of its residents to a level that can be sustained by our one planet (the typical American lifestyle requires 5 planet’s worth of resources). The principles of the One Planet program extend beyond just the built environment to include reducing carbon from transportation and food. The Grow Community includes net-zero energy houses and apartments, powered entirely by solar, community gardens outside every front door, and a car share program – also powered by solar. The response to the community was unprecedented – 23 homes were sold before they were ever listed on the MLS. There is a wait list for the apartments and a long list of interested buyers for the next two phases. It is clear that buyers are interested in living sustainably, especially if we can make it easy, attractive and affordable. 5. Last but not least what is your favorite neighborhood in Seattle right now, where do you like to hangout and grab a drink? Bainbridge of course! The island is not often thought of as a neighborhood in Seattle, but it is, really. Many people live here and commute into Seattle. It has a wonderful small town feel and the best commute on the planet! Lately I’ve been spending a lot of time at the Bainbridge Island Art Museum bistro. It is the perfect lunch spot (the soups and the salads are incredible), a great meeting spot and a good excuse to wander around the museum. Did I mention the best part – entrance to the art museum is free to everyone so you can feel free to wander for a short while and come back any time. The museum is powered by itek solar panels too.